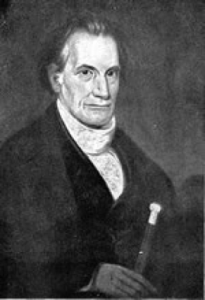 In 1813-14, William Cary, having migrated from New Hampshire to Cincinnati in 1802, purchased 491 acres (1.99 km2) north of Cincinnati along what is now Hamilton Avenue. Cary built a log cabin and moved his family to this “wilderness,” then known as Mill Creek Township. In 1833, Cary’s son Freeman G. Cary (portrait on the right by Robert S. Duncanson) established Pleasant Hill Academy for boys on part of his land. The academy became an agricultural school called Farmer’s College in 1846. Rev. Dr. Robert Bishop, the first president of Miami University, became a professor at Farmers’ C ollege from 1845. 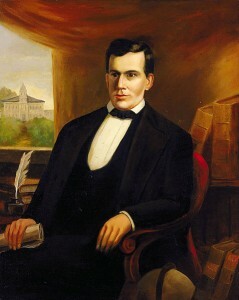 Fellow Miami professor John W. Scott came with him to Farmers’ College, but left in 1849 to found the Women’s College at Miami. Dr. Bishop was well loved and an outstanding teacher and preached at the Farmers’ College Chapel until his death in 1855. 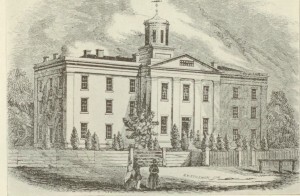 Many sons of abolitionists attended Farmers’ College, some of whom assisted the many abolitionists on the “hill” to make College Hill an active station on the Underground Railroad. Farmers’ College operated until 1885 when it became Belmont College.